Found growing in sandy soils mainly in New South Wales Persoonia pinifolia is commonly called ‘The Fine Leaf Geebung’. A small to medium shrub reaching between 1 and 3m depending on conditions it has attractive yellow flower in late summer and interesting pine like foliage. The flowers are followed by small purple berries from which seed can be collected. 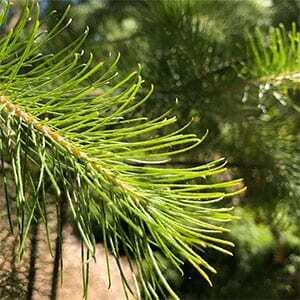 The pine like foliage gives it a second common name of Australian Christmas tree. 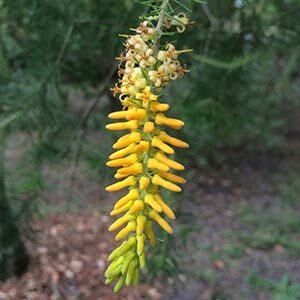 Persoonia pinifolia is an easy plant to grow in a well drained soil. It grows naturally in mid New South Wales. From coastal areas inland. Some very light pruning from a young age can help to ensure a good bushy habit. This is more effective that hard pruning later on. A light application of specialist native plant fertiliser in spring may improve the growth rate. Foliage – Attractive mid green. Flowers – Terminal Yellow flowers. Flowering period – Late Summer to Autumn. Frost tolerant – High once established.